Are you interested in how the mind and brain works, and how science can explain social and criminal behaviour? 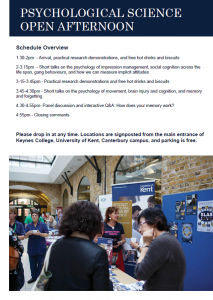 Would you like to know more about psychological research? Then come to our open afternoon and learn more! There will be short talks by researchers on a variety of topics, as well as practical demonstrations of research protocols and specialist equipment. The event is FREE and open to ALL. 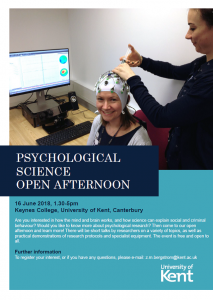 Further information: To register your interest, or if you have any questions, please e-mail: z.m.bergstrom@kent.ac.uk. You can also express interest through the Facebook event page.